Coventry City complete Aaron Martin signing. Coventry City have completed their second signing of the day with the free transfer of Aaron Martin from Yeovil Town. Martin has signed an 18 month contract with The Sky Blues, following his second loan spell with the club. 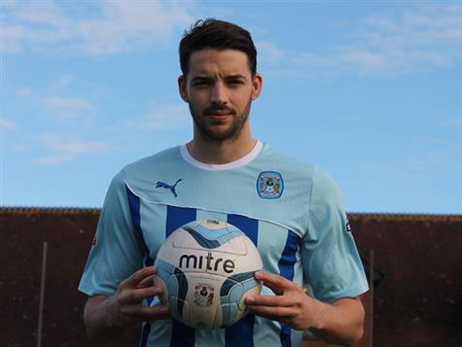 Originally joining the club on loan from Southampton in 2013 making 13 appearances, Martin rejoined the club as part of the deal which saw Jordan Clarke join Yeovil in November, going on to play a further 9 times in the Sky Blue shirt. Martin has now agreed to a mutual termination of his Yeovil contract, allowing him to complete a permanent switch to Steven Pressley’s side. The City boss said: “We’re delighted to be able to bring Aaron here on a permanent basis. “We tried to bring Aaron to the club two years ago and he is a player that I have tracked ever since. “He is a terrific professional with a real desire to improve and we believe that we can give him the confidence and platform to do so. With Martin completing his transfer, Jordan Clarke is now expected to complete his move to fellow League One side Scunthorpe United where he will link up with former Sky Blues boss Mark Robins. « Coventry sign Nouble; McQuoid returns to Bournemouth.